The following is a transcript from January 6, 2014, in Christ Chapel of Gustavus Adolphus College (St. Peter, MN). As part of the “Daily Sabbath” January-Term rhythm, this homily examines Matthew 2:1-12 and considers the relationship between theology and development. The work of the late South African theologian Steve de Gruchy (“Wise Men Bearing Gifts”, Church World Mission) was instrumental in producing this message. Throughout the month of January, students from a wide variety of U.S. colleges and universities travel to a wide variety of foreign countries and territories throughout the world. While some do so simply to escape the clutches of the winter cold, others do so with the goal of actually learning something new. More specifically, some learners possess the more particular hopes of learning something new about how to help those around the world who endure the massive pressures of extreme poverty. * Nearly 900 million people worldwide do not have enough food to eat. Which means, there is indeed much to be seen and heard as there are indeed many in our world that need help. Which therefore means, because we in the U.S. have opportunities and capabilities to help, we should indeed attempt to learn more about how one can help. When we in the U.S. seem to have so much, and others around the world seem to have so little, how do we possibly begin to help those who are under far more pressure than ourselves? These important questions should ultimately lead us into authentic conversation and bold action surrounding relief, development, advocacy, and large-scale political and economic structures and systems. However, we can begin our search for implementation with interpretation. More specifically, our Epiphany Gospel lesson from today, taken from Matthew 2:1-12, is in many ways, an interpretive guide for how we in the U.S. can engage in the alleviation of extreme global poverty, both locally and globally. One of the many ways of reading Matthew 2:1-12 is to see how the Magi symbolize – in today’s global configuration – people from the so-called “global north” who possess wealth and wisdom, and who genuinely seek to accompany those who live with economic pressures far greater than themselves. To take it further, Herod symbolizes the local elites of the so-called “global south” that so often control the political economy of the “global south”. And to take it even further, the holy family of Joseph, Mary, and Jesus symbolizes the millions of vulnerable people who live in extreme poverty. With these interpretive metaphors in mind, in the narrative, the Magi from the so-called “global north” first make contact with those in the so-called “global south” whom they have an affinity, namely a representative of the political and economic elite, who is Herod (v.1). But as we know, Herod has absolutely no genuine interest in the vulnerable poor in his own country, and like many elites in the so-called “global south” today, Herod seeks to manipulate those in the “global north” to serve his own ends (v.3). 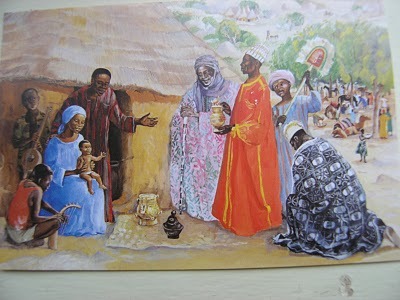 However, the story from Matthew’s Gospel turns on the fact that the Scriptures point the Magi to Bethlehem (v.5-6), where they learn that the one whom they must respect in God’s scheme of things is not to be found in amongst the powerful in the plush palace, but in a humble shack among the filth of animals. Which means, the journey of the Magi, guided by the words of the prophet (v.5) and God’s star (v.6) lead them not to the seat of power with Herod, but into the presence of the poor, and more specifically, into the humble company of Mary, Joseph and the infant Jesus. And so, “What does this all mean” for us? What does this all mean at this time, for us, in this place? What does this mean for those of us in the so-called “global north” who are relatively powerful and privileged yet have a genuine interest in seeking out the welfare of those in the so-called “global south”? More specifically, what does this mean when we know how tempting it is to stay in the palace, and what does it mean, when deep down, we know that far too often our alliances around the world are with those who have no real interest with the actual welfare of the poor? The answers to these difficult questions may not be discovered today, but we can begin, I believe, with the Magi of Matthew’s Gospel. As we look back into the 2nd Chapter of Matthew, we recognize that somehow, in their journey, the Magi were touched by God’s presence, became suspicious of the agenda of the elites, and found joy in forging an authentic relationship with the poor. In addition, in what can be described as nothing short of incredible, the gifts of the Magi were offered to the holy family, not to bribe, create dependency, or leverage influence, but the gifts were given to Joseph, Mary, and Jesus as a sign of homage and respect, and as an indication of their willingness to have their agenda shaped not by their own interests, but by the concerns of the poor. Which ultimately means, the Magi did not travel to Bethlehem to help the poor, but they came to accompany the poor, and in doing so, they were informed, formed, and transformed by God through their authentic relationship of deep solidarity with the poor. And as we gather here this morning, at this time and in this place, we can only begin to dream about what our world would look like if we learned to do the same. My friends, the Magi found within Matthew’s narrative point us toward how we should faithfully accompany those around our world – both near and far – living under the pressures of poverty, as we – at this time and in this place – are pressed into global and local companionship that affirms the poor as subjects of history and not merely the objects. In other words, rather than the powerful setting the agenda for those under pressure, we with relative power and privilege must allow all members of our global village to name and implement their own priorities. Which means, as members of one human family, we journey alongside one another as companions regardless of economic status, and by God’s grace, seek fruitful cooperation to the best of our collective abilities for the benefit of our collective common good. Which ultimately means, when we travel to foreign lands – whether such foreign lands are thousands of miles away or just a few steps out the door – in response to the ways in which God accompanies us in our daily lives, we refuse to stay in the palaces of power, but instead, our foreign policy includes looking for the barn and filth to listen, learn, and see where Jesus is most fully present. Why? Because it is in the struggle for life that God is made known, and it is in deep solidarity with the poor and marginalized of our world to which we are led by Jesus, for as the Magi remind us, it is only when we allow the suffering to be heard do we truly hear the truths of our world. And so, to conclude, as we continue to discern our places in this world, the time is upon us to follow the lead of the Magi. Instead of seeking out alliances with the privileged and powerful, and rather than thinking that we have all the answers for those in poverty, we are humbled at the foot of the manger, the light of God is revealed, we are moved to embody mutuality and companionship, and we are empowered to recognize the godly wisdom and assets of impoverished communities both near and far. And in doing so, the awesome reality of Jesus’ birth provides us with comfort, but also with confrontation with the path laid out before us. Which means, whether you are traveling thousands of miles away during this month of January, or whether you are staying here in Minnesota, may you do so with eyes wide open, to see the ways in which God is revealed in foreign communities both near and far, at this time and in this place, in deep solidarity with the poor, and in faithfulness to the Prince of Peace born two thousand years ago. May God bless you in this journey, this day and always, and may the light of Christ continue to bring joy to all of this world. Amen.